The Sultanate of Rûm (also known as the Rûm sultanate (Persian: سلجوقیان روم‎, Saljuqiyān-e Rum), Anatolian Seljuk Sultanate, Sultanate of Iconium, Anatolian Seljuk State (Turkish: Anadolu Selçuklu Devleti) or Turkey Seljuk State (Turkish: Türkiye Selçuklu Devleti) was a Turko-Persian Sunni Muslim state established in the parts of Anatolia which had been conquered from the Byzantine Empire by the Seljuk Empire, which was established by the Seljuk Turks. The name Rûm was a synonym for Greek, as it remains in modern Turkish, although it derives from the Arabic name for Romans, الرُّومُ ar-Rūm, itself a loan from Greek Ῥωμαῖοι, "Romans"; ie. citizens superordinately to Latin-speakers. The Sultanate of Rum seceded from the Great Seljuk Empire under Suleiman ibn Qutulmish in 1077, following the Battle of Manzikert, with capitals first at İznik and then at Konya. It reached the height of its power during the late 12th and early 13th century, when it succeeded in taking Byzantine key ports on the Mediterranean and Black Sea coasts. In the east, the sultanate absorbed other Turkish states and reached Lake Van. Trade from Iran and Central Asia across Anatolia was developed by a system of caravanserai. Especially strong trade ties with the Genoese formed during this period. The increased wealth allowed the sultanate to absorb other Turkish states that had been established in eastern Anatolia (Danishmends, Mengujekids, Saltukids, Artuqids). The Seljuq sultans bore the brunt of the Crusades and eventually succumbed to the Mongol invasion in 1243 (Battle of Köse Dağ). For the remainder of the 13th century, the Seljuqs acted as vassals of the Ilkhanate. Their power disintegrated during the second half of the 13th century. The last of the Seljuq vassal sultans of the Ilkhanate, Mesud II, was murdered in 1308. The dissolution of the Seljuq state left behind many small Anatolian beyliks (Turkish principalities), among them that of the Ottoman dynasty, which eventually conquered the rest and reunited Anatolia to become the Ottoman Empire. In the 1070s, after the battle of Manzikert, the Seljuk commander Suleiman ibn Qutulmish, a distant cousin of Malik-Shah I and a former contender for the throne of the Seljuk Empire, came to power in western Anatolia. In 1075, he captured the Byzantine cities of Nicaea (İznik) and Nicomedia (İzmit). Two years later, he declared himself sultan of an independent Seljuq state and established his capital at İznik. Suleiman was killed in Antioch in 1086 by Tutush I, the Seljuk ruler of Syria, and Suleiman's son Kilij Arslan I was imprisoned. When Malik Shah died in 1092, Kilij Arslan was released and immediately established himself in his father's territories. Seljuk Sultanate of Rum in 1190. Kilij Arslan was defeated by soldiers of the First Crusade and driven back into south-central Anatolia, where he set up his state with capital in Konya. In 1107, he ventured east and captured Mosul but died the same year fighting Malik Shah's son, Mehmed Tapar. Meanwhile, another Rum Seljuq, Malik Shah (not to be confused with the Seljuq sultan of the same name), captured Konya. In 1116 Kilij Arslan's son, Mesud I, took the city with the help of the Danishmends. Upon Mesud's death in 1156, the sultanate controlled nearly all of central Anatolia. Mesud's son, Kilij Arslan II, captured the remaining territories around Sivas and Malatya from the last of the Danishmends. At the Battle of Myriokephalon in 1176, Kilij Arslan II also defeated a Byzantine army led by Manuel I Komnenos, dealing a major blow to Byzantine power in the region. Despite a temporary occupation of Konya in 1190 by the Holy Roman Empire's forces of the Third Crusade, the sultanate was quick to recover and consolidate its power. During the last years of Kilij Arslan II's reign, the sultanate experienced a civil war with Kaykhusraw I fighting to retain control and losing to his brother Suleiman II in 1196. Süleymanshah II rallied his vassal emirs and marched against Georgia, with an army of 150,000-400,000 and encamped in the Basiani valley. Tamar of Georgia quickly marshaled an army throughout her possessions and put it under command of her consort, David Soslan. Georgian troops under David Soslan made a sudden advance into Basiani and assailed the enemy’s camp in 1203 or 1204. In a pitched battle, the Seljuqid forces managed to roll back several attacks of the Georgians but were eventually overwhelmed and defeated. Loss of the sultan's banner to the Georgians resulted in a panic within the Seljuq ranks. Süleymanshah himself was wounded and withdrew to Erzurum. Both the Rum Seljuk and Georgian armies suffered heavy casualties, but coordinated flanking attacks won the battle for the Georgians. The Sultanate of Rûm and surrounding states, c. 1200. Suleiman II (1196–1204) was routed by the Kingdom of Georgia in the Battle of Basian (1203) and died in 1204. He was succeeded by his son Kilij Arslan III, whose reign was unpopular. Kaykhusraw I seized Konya in 1205 reestablishing his reign. Under his rule and those of his two successors, Kaykaus I and Kayqubad I, Seljuq power in Anatolia reached its apogee. Kaykhusraw's most important achievement was the capture of the harbour of Attalia (Antalya) on the Mediterranean coast in 1207. His son Kaykaus captured Sinop and made the Empire of Trebizond his vassal in 1214. He also subjugated Cilician Armenia but in 1218 was forced to surrender the city of Aleppo, acquired from al-Kamil. Kayqubad continued to acquire lands along the Mediterranean coast from 1221 to 1225. In the 1220s, he sent an expeditionary force across the Black Sea to Crimea. In the east he defeated the Mengujekids and began to put pressure on the Artuqids. The sultanate expanded towards the east during the reign of Kayqubad I.
Kaykhusraw II (1237–1246) began his reign by capturing the region around Diyarbakır, but in 1239 he had to face an uprising led by a popular preacher named Baba Ishak. After three years, when he had finally quelled the revolt, the Crimean foothold was lost and the state and the sultanate's army had weakened. It is in these conditions that he had to face a far more dangerous threat, that of the expanding Mongols. The forces of the Mongol Empire took Erzurum in 1242 and in 1243, the sultan was crushed by Baiju in the Battle of Köse Dağ (a mountain between the cities of Sivas and Erzincan), and the Seljuq Turks were forced to swear allegiance to the Mongols and became their vassals. The sultan himself had fled to Antalya after the 1243 battle, where he died in 1246, his death starting a period of tripartite, and then dual, rule that lasted until 1260. The Seljuq realm was divided among Kaykhusraw's three sons. The eldest, Kaykaus II (1246–1260), assumed the rule in the area west of the river Kızılırmak. His younger brothers, Kilij Arslan IV (1248–1265) and Kayqubad II (1249–1257), were set to rule the regions east of the river under Mongol administration. In October 1256, Bayju defeated Kaykaus II near Aksaray and all of Anatolia became officially subject to Möngke Khan. In 1260 Kaykaus II fled from Konya to Crimea where he died in 1279. Kilij Arslan IV was executed in 1265, and Kaykhusraw III (1265–1284) became the nominal ruler of all of Anatolia, with the tangible power exercised either by the Mongols or the sultan's influential regents. The Seljuq state had started to split into small emirates (beyliks) that increasingly distanced themselves from both Mongol and Seljuq control. In 1277, responding to a call from Anatolia, the Mamluk sultan, Baibars, raided Anatolia and defeated the Mongols, temporarily replacing them as the administrator of the Seljuq realm. But since the native forces who had called him to Anatolia did not manifest themselves for the defense of the land, he had to return to his home base in Egypt, and the Mongol administration was re-assumed, officially and severely. Also, the Armenian Kingdom of Cilicia captured the Mediterranean coast from Selinos to Seleucia, as well as the cities of Marash and Behisni, from the Seljuq in the 1240s. Near the end of his reign, Kaykhusraw III could claim direct sovereignty only over lands around Konya. Some of the beyliks (including the early Ottoman state) and Seljuq governors of Anatolia continued to recognize, albeit nominally, the supremacy of the sultan in Konya, delivering the khutbah in the name of the sultans in Konya in recognition of their sovereignty, and the sultans continued to call themselves Fahreddin, the Pride of Islam. When Kaykhusraw III was executed in 1284, the Seljuq dynasty suffered another blow from internal struggles which lasted until 1303 when the son of Kaykaus II, Mesud II, established himself as sultan in Kayseri. He was murdered in 1308 and his son Mesud III soon afterwards. A distant relative to the Seljuq dynasty momentarily installed himself as emir of Konya, but he was defeated and his lands conquered by the Karamanids in 1328. The sultanate's monetary sphere of influence lasted slightly longer and coins of Seljuq mint, generally considered to be of reliable value, continued to be used throughout the 14th century, once again, including by the Ottomans. The Seljuk dynasty of Rum, as successors to the Great Seljuqs, based their political, religious and cultural heritage on the Perso-Islamic tradition, even to the point of naming their sons with Persian names. Though of Turkic origin, Rum Seljuks patronized Persian art, architecture, and literature and used Persian as a language of administration. Moreover, Byzantine influence in the Sultanate was also significant, since Greek aristocracy remained part of the Seljuk nobility, and the local Greek population was numerous in the region. Kızıl Kule (Red Tower) built between 1221–1226 by Kayqubad I in Alanya. In their construction of caravanserais, madrasas and mosques, the Rum Seljuks translated the Iranian Seljuk architecture of bricks and plaster into the use of stone. Among these, the caravanserais (or hans), used as stops, trading posts and defense for caravans, and of which about a hundred structures were built during the Anatolian Seljuqs period, are particularly remarkable. Along with Persian influences, which had an indisputable effect, Seljuk architecture was inspired by Christian and Muslim Armenians. As such, Anatolian architecture represents some of the most distinctive and impressive constructions in the entire history of Islamic architecture. Later, this Anatolian architecture would be transmitted to Sultanate India. The largest caravanserai is the Sultan Han (built in 1229) on the road between the cities of Konya and Aksaray, in the township of Sultanhanı depending the latter city, enclosing 3,900 m2 (42,000 sq ft). There are two caravanserais that carry the name "Sultan Han", the other one being between Kayseri and Sivas. Furthermore, apart from Sultanhanı, five other towns across Turkey owe their names to caravanserais built there. These are Alacahan in Kangal, Durağan, Hekimhan and Kadınhanı, as well as the township of Akhan within the Denizli metropolitan area. The caravanserai of Hekimhan is unique in having, underneath the usual inscription in Arabic with information relating to the edifice, two further inscriptions in Armenian and Syriac, since it was constructed by the sultan Kayqubad I's doctor (hekim) who is thought to have been a Christian by his origins, and to have converted to Islam. There are other particular cases like the settlement in Kalehisar (contiguous to an ancient Hittite site) near Alaca, founded by the Seljuq commander Hüsameddin Temurlu, who had taken refuge in the region after the defeat in the Battle of Köse Dağ and had founded a township comprising a castle, a madrasa, a habitation zone and a caravanserai, which were later abandoned apparently around the 16th century. All but the caravanserai, which remains undiscovered, was explored in the 1960s by the art historian Oktay Aslanapa, and the finds as well as a number of documents attest to the existence of a vivid settlement in the site, such as a 1463 Ottoman firman which instructs the headmaster of the madrasa to lodge not in the school but in the caravanserai. The Seljuk palaces, as well as their armies, were staffed with ghulams (plural ghilmân, Arabic: غِلْمَان‎), enslaved youths taken from non-Muslim communities, mainly Greeks from former Byzantine territories. The practice of keeping ghulams may have offered a model for the later devşirme during the time of the Ottoman Empire. As regards the names of the sultans, there are variants in form and spelling depending on the preferences displayed by one source or the other, either for fidelity in transliterating the Persian variant of the Arabic script which the sultans used, or for a rendering corresponding to the modern Turkish phonology and orthography. Some sultans had two names that they chose to use alternatively in reference to their legacy. While the two palaces built by Alaeddin Keykubad I carry the names Kubadabad Palace and Keykubadiye Palace, he named his mosque in Konya as Alâeddin Mosque and the port city of Alanya he had captured as "Alaiye". Similarly, the medrese built by Kaykhusraw I in Kayseri, within the complex (külliye) dedicated to his sister Gevher Nesibe, was named Gıyasiye Medrese, and the one built by Kaykaus I in Sivas as Izzediye Medrese. 1. Qutalmish 1060–1064 Contended with Alp Arslan for succession to the Imperial Seljuq throne. ^ Grousset, Rene, The Empire of the Steppes: A History of Central Asia, (Rutgers University Press, 2002), 157; "...the Seljuk court at Konya adopted Persian as its official language." ^ Bernard Lewis, Istanbul and the Civilization of the Ottoman Empire, (University of Oklahoma Press, 1963), 29; "The literature of Seljuk Anatolia was almost entirely in Persian...". ^ ""Modern Turkish is the descendant of Ottoman Turkish and its predecessor, so-called Old Anatolian Turkish, which was introduced into Anatolia by the Seljuq Turks in the late 11th century ad."". Encyclopædia Britannica. Retrieved 30 September 2017. ^ Andrew Peacock and Sara Nur Yildiz, The Seljuks of Anatolia: Court and Society in the Medieval Middle East, (I.B. Tauris, 2013), 132; "The official use of the Greek language by the Seljuk chancery is well known". ^ Bernard Lewis, Istanbul and the Civilization of the Ottoman Empire, 29; "Even when the land of Rum became politically independent, it remained a colonial extension of Turco-Persian culture which had its centers in Iran and Central Asia","The literature of Seljuk Anatolia was almost entirely in Persian ..."
^ "Institutionalisation of Science in the Medreses of pre-Ottoman and Ottoman Turkey", Ekmeleddin Ihsanoglu, Turkish Studies in the History and Philosophy of Science, ed. Gürol Irzik, Güven Güzeldere, (Springer, 2005), 266; "Thus, in many of the cities where the Seljuks had settled, Iranian culture became dominant." ^ Turko-Persia in Historical Perspective, ed. Robert L. Canfield, (Cambridge University Press, 1991), 13. ^ Alexander Kazhdan, "Rūm" The Oxford Dictionary of Byzantium (Oxford University Press, 1991), vol. 3, p. 1816. Paul Wittek, Rise of the Ottoman Empire, Royal Asiatic Society Books, Routledge (2013), p. 81: "This state too bore the name of Rûm, if not officially, then at least in everyday usage, and its princes appear in the Eastern chronicles under the name 'Seljuks of Rûm' (Ar. : Salâjika ar-Rûm). A. Christian Van Gorder, Christianity in Persia and the Status of Non-muslims in Iran p. 215: "The Seljuqs called the lands of their sultanate Rum because it had been established on territory long considered 'Roman', i.e. Byzantine, by Muslim armies." ^ a b John Joseph Saunders, The History of the Mongol Conquests, (University of Pennsylvania Press, 1971), 79. ^ Sicker, Martin, The Islamic world in ascendancy: from the Arab conquests to the siege of Vienna , (Greenwood Publishing Group, 2000), 63-64. ^ a b Anatolia in the period of the Seljuks and the "beyliks", Osman Turan, The Cambridge History of Islam, Vol. 1A, ed. P.M. Holt, Ann K.S. Lambton and Bernard Lewis, (Cambridge University Press, 1995), 244-245. ^ A.C.S. Peacock and Sara Nur Yildiz, The Seljuks of Anatolia: Court and Society in the Medieval Middle East, (I.B. Tauris, 2015), 29. ^ a b c d Alexander Mikaberidze, Historical Dictionary of Georgia, (Rowman & Littlefield, 2015), 184. ^ a b c Claude Cahen, The Formation of Turkey: The Seljukid Sultanate of Rum: Eleventh to Fourteenth, transl. & ed. P.M. Holt, (Pearson Education Limited, 2001), 42. ^ A.C.S. Peacock, "The Saliūq Campaign against the Crimea and the Expansionist Policy of the Early Reign of'Alā' al-Dīn Kayqubād", Journal of the Royal Asiatic Society, Vol. 16 (2006), pp. 133-149. ^ Saljuqs: Saljuqs of Anatolia, Robert Hillenbrand, The Dictionary of Art, Vol.27, Ed. Jane Turner, (Macmillan Publishers Limited, 1996), 632. ^ Rudi Paul Lindner, Explorations in Ottoman Prehistory, (University of Michigan Press, 2003), 3. ^ "A Rome of One's Own: Reflections on Cultural Geography and Identity in the Lands of Rum", Cemal Kafadar,Muqarnas, Volume 24 History and Ideology: Architectural Heritage of the "Lands of Rum", Ed. Gülru Necipoğlu, (Brill, 2007), page 21. ^ West Asia:1000-1500, Sheila Blair and Jonathan Bloom, Atlas of World Art, Ed. John Onians, (Laurence King Publishing, 2004), 130. ^ Architecture (Muhammadan), H. Saladin, Encyclopaedia of Religion and Ethics, Vol.1, Ed. James Hastings and John Alexander, (Charles Scribner's son, 1908), 753. ^ Armenia during the Seljuk and Mongol Periods, Robert Bedrosian, The Armenian People From Ancient to Modern Times: The Dynastic Periods from Antiquity to the Fourteenth Century, Vol. I, Ed. Richard Hovannisian, (St. Martin's Press, 1999), 250. ^ Lost in Translation: Architecture, Taxonomy, and the "Eastern Turks", Finbarr Barry Flood, Muqarnas: History and Ideology: Architectural Heritage of the "Lands of Rum, 96. Bosworth, C. E. (2004). The New Islamic Dynasties: a Chronological and Genealogical Manual. Edinburgh University Press. ISBN 0-7486-2137-7. Bektaş, Cengiz (1999). 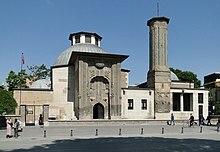 Selcuklu Kervansarayları, Korunmaları Ve Kullanlmaları üzerine bir öneri: A Proposal regarding the Seljuk Caravanserais, Their Protection and Use (in Turkish and English). ISBN 975-7438-75-8. Yavuz, Ayşıl Tükel. "The concepts that shape Anatolian Seljuq caravanserais" (PDF). ArchNet. Archived from the original (PDF) on 2007-07-04. "List of Seljuk edifices". ArchNet. Archived from the original on 2007-04-05. Katharine Branning. "Examples of caravanserais built by the Anatolian Seljuk Sultanate". Turkish Hans.